Having spent years experimenting with the colour of my hair during my teens and twenties I had finally succumbed to the 'au naturale' look and then the dreaded greys began to set in. This has led to me needing a root tint every 6-8 weeks and my hair drying out even faster than my peroxided blonde days (a teen obsession with Britney Spears has a lot to answer for). So in my quest to find a new hair routine that would keep my tresses soft and supple I couldn't wait to try PHYTO'S 5 step hair routine and really see what Wendy has been raving about for all of these years! For PHYTO, hair beauty & health can only be achieved through a thorough approach. 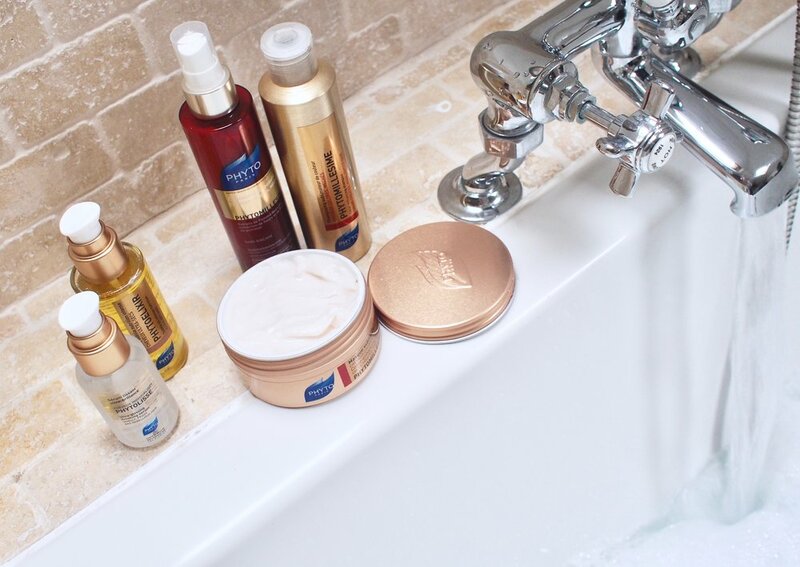 Beautiful hair can only come with a healthy scalp. This is why PHYTO takes care of hair from the root to the tip. For me this has been a real game changer. I have experimented with pre-shampoo treatments in the past but they have always left my hair feeling slightly greasy and heavy. Not this one though. It only needs to be on for 10 minutes so it's really convenient when my hair is feeling ultra-dry. I have also used it as an overnight oil before washing my hair in the morning. The results have been super silky shiny hair that is much more manageable and easy to style. "This luxurious, lightweight and easy-to-rinse formula effortlessly penetrates into each strand bringing ultra-dry or damaged hair back to life. Particularly rich in vitamin E, ultra- nourishing oil yolk blends with camellia and karanja oils to regenerate and protect the hair fibre from external aggressions. Hair feels immediately replenished and its original softness, elasticity, and shine are restored. Formula is 98% natural and botanical. " A colour protecting shampoo is a must once you start to go grey. The number of times I have paid a fortune for the perfect natural looking root tint only to then use the wrong shampoo and be left with the halo effect. 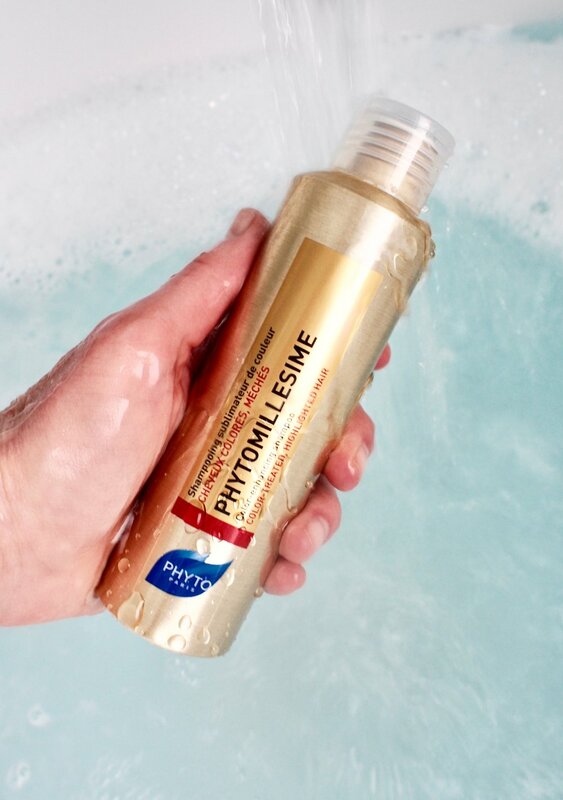 This PHYTO Phytomillesime Colour Enhancing Shampoo has been faultless at keeping my colour strong and unfaded. "Just after colouring your hair, your colour is shiny, vibrant and you love it! But from the first shampoo, the colour fades away and becomes dull. This sulfate-free shampoo, with its delicate lather, protects colour from fading. Hair is infinitely silky and shiny." I used to always use a hair mask once a week as a treat for my hair and found it left it so much more manageable and healthy than just a regular conditioner. So now it's what I use every time I shampoo and my hair is so much happier for it. This gorgeous Colour Enhancing Mask from PHYTO is so nourishing you only need to use a tiny amount too meaning that it last so much longer than other brands I've tried. It also smells divine. "Just after colouring your hair, your colour is shiny, vibrant and you love it! But from the first shampoo, the colour fades away and becomes dull. Enriched with Argan butter, this mask repairs and nourishes the hair fibre. Colour is vibrant and hair is easy to style, incredibly silky and shiny." Use after shampoo. Apply a dab of product to damp or towel-dried hair from lengths to ends. For fine hair leave on for 2 to 3 minutes, thick hair 5 to 10. Detangle. Rinse thoroughly. This must be the Holy Grail when it comes to colour treated hair. It gives such a great shine and texture to the hair that you get that 'just left the salon' feeling every time you use it and it even lasts 'til the next time you wash! "When sprayed onto damp hair after washing or onto dry hair as a daily leave-in product. 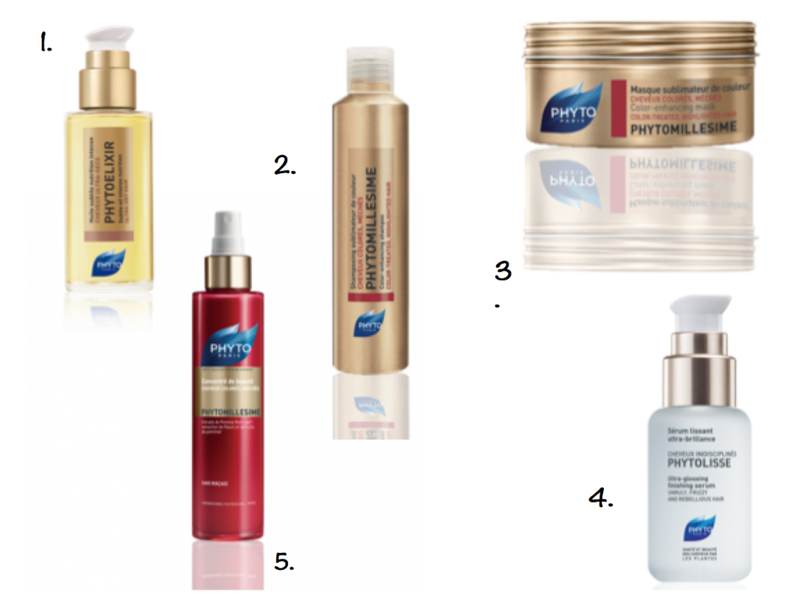 The Phytomillesime beauty concentrate combines the three essential actions for colour-treated or highlighted hair." Intense protection: Hair colour keeps its vibrancy. This protection helps to improve the resistance of colour-treated and highlighted hair to external aggressions. Ultimate care: The hair is perfectly cared for, scales are smoothed and colour reveals an incomparable shine, with a new, pure, intense and dazzling radiance. Easier styling: Detangling becomes a breeze. Hair is easier to style, frizz is controlled. This product has very quickly migrated from my bathroom cupboard and in to my handbag as I rely on it so much! The perfect quick fix when you've been caught in the rain and the frizz sets in or after long days in the sun when your hair is feeling slightly frazzled. "A finishing serum that adds gorgeous shine and keeps frizz under control, but feels like it's barely there. Formula is so lightweight it can be used throughout the day to control curls, tame frizz, and calm flyaway's. Hair is left incredibly soft, shiny and weightless to the touch." Apply a drop of serum on dry hair, mid-lengths to ends, as a finisher. Use throughout the day to fight frizz and calm flyaway's.